Teeth are meant to touch and chew against one another, and to fit like very well designed gears. When teeth don’t fit ideally, and one or more teeth touch harder than another, there are significant long-term consequences. The reason for adjusting the bite is to avoid the continued process of damage and destruction that will occur if the conditions are left alone. Many people clench and/or grind their teeth. This is very common, and usually occurs with increased frequency and intensity during times of stress. Clenching and grinding of teeth although common, usually does NOT occur if teeth fit well. It is also true that even if someone does not detect that they are clenching or grinding their teeth they still can have destructive forces on them. Bite guards (often also called night guards) have long been used to treat clenching and grinding, and they can be useful if symptoms persist even after teeth have been accurately reshaped. When the jaws close and teeth touch together, the jaws act as hinges. The teeth should come together evenly, at the same time, with evenly distributed force, without any tooth or teeth touching before another. When teeth don’t touch evenly, this puts stress on the teeth, supporting bone, jaw joints and muscles. If teeth are substantially out of position, then orthodontics (braces, retainers, etc.) are indicated. If other symptoms are present, such as muscle or jaw joint problems, other treatments may be indicated. When teeth are fairly well aligned, and still not touching perfectly, then reshaping them to fit more gently is indicated. The process of reshaping can include just a few teeth or all teeth. In fact, almost all people require bite adjustment when braces are completed, because even though teeth are aligned, the points and grooves are still not touching perfectly. Reshaping the teeth to make them fit better and touch more gently harmonizes the relationship between the teeth, the jaw joints and the muscles. Reshaping is referred to by various names: bite adjustment, occlusal adjustment, equilibration, or selective grinding – they all mean the same thing. The points and grooves of teeth can tolerate the forces placed on them on specific parts of each tooth. These are identified by different means, and the areas not supposed to touching are reshaped. 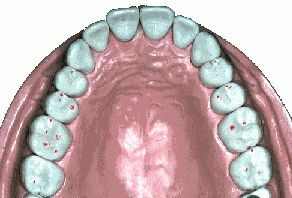 See the picture below where red indicator marks on teeth show where opposing teeth touch. Symptoms that involve muscles, jaw joints, and face-head-neck pain may have other causes as well, that must be ruled out. Nonetheless, when the teeth are touching too hard, this too must be addressed. The first step in the process of bite adjustment is to adequately diagnose that a problem exists. Many times an assumption is made that a problem = pain, when for issues related to the bite, pain is often one of the last symptoms. A comprehensive examination, including x-rays, is required to adequately diagnose conditions present. Sometimes models are made of your teeth and placed on an instrument called an articulator to simulate jaw and tooth movement and better diagnose your bite status. Other diagnostic tools may include joint x-rays, MRI, CT scan, electromyographs, T-Scan, MMPI, etc..
Next, teeth are marked with an indicator tape while teeth are closed and made to move in different directions simulating jaw movement. With the knowledge and experience about how and where teeth best tolerate forces placed on them, we reshape teeth so that they are not only touching where they are supposed to, but also with the degree of force that is distributed among teeth that can take the force. The actual reshaping is done with carbide or diamond tips and a handpiece (dental drill). See the picture above with red indicator marks on the teeth. A significant part of the reshaping process also involves making sure that the chewing and biting surfaces have the necessary point / groove pattern to allow food to escape while being chewed. A very flat surface can create great force on the tooth, and merely re-creating some more ideal groove pattern can alleviate the force on the tooth. When teeth fit unevenly, the enamel is already being worn away. Precision reshaping prevents future wear. Only the enamel is reshaped, and enamel has no feeling. Occasionally, so much reshaping might be required that a filling or crown is necessary to give a tooth its proper contour, and in that case appropriate anesthesia is used. The teeth are being weakened by the destructive forces placed on them, reshaping protects and strengthens them. As the reshaping progresses, it often becomes apparent to the person that their bite is improving when they close their teeth together. This is actually a very helpful component to the process to rely on what the client feels as well. It may take a number of visits to get the bite exactly right. As the larger discrepancies are reshaped at the initial visit, the client often discovers smaller spots that although the indicator markings seem accurate, the client can detect some teeth that touch just a little too much relative to other teeth. These are addressed at subsequent visits. Once the reshaping is completed the reshaped areas are polished and checked. It is important to note that once the bite is adjusted properly, your teeth may again in the future require some bite adjustment. If a comprehensive bite adjustment of all teeth is done, perhaps only a few teeth may require later adjustment. The reason for this is that over decades teeth can move slightly, teeth wear, etc., making the fit of teeth change some. It is always appropriate after the initial bite adjustment to monitor for further signs and symptoms, and to re-evaluate the effectiveness (reduction / elimination of symptoms) of the bite adjustment at future visits.